Background and aims New options are needed for the management and prevention of colorectal cancer liver metastases. Interleukin 12 (IL-12) is an immunostimulatory cytokine with proven antitumour effect in animal models. Despite evidence indicating its biological effect in humans, neither the recombinant protein nor gene therapy vectors expressing IL-12 have shown a relevant benefit in patients with cancer. Objective To develop a new approach to overcome the difficulties in obtaining a suitable expression pattern and the immunosuppressive milieu in the tumours which contribute to this poor performance. Methods A high-capacity (‘gutless’) adenoviral vector carrying a liver-specific, mifepristone (Mif)-inducible system for the expression of IL-12 (HC-Ad/RUmIL-12) was used in combination with chemotherapy. Tumours were established in the liver of C57BL/6 mice by inoculation of MC38 colon cancer cells. Results Intrahepatic injection of HC-Ad/RUmIL-12 and tailored induction regimens allowed the maintenance of safe and efficient levels of IL-12 in vivo. An individualised, stepwise increase in the dose of Mif (125–4000 μg/kg) was needed to compensate for the progressive but transient downregulation of the inducible system. Repeated cycles of Mif induction (every 24 h for 10 days) were needed for optimal tumour eradication. However, complete protection against tumour rechallenge was seen in <25% of the animals. The administration of oxaliplatin (5 mg/kg intraperitoneally) 3 days before starting the induction regimen achieved efficient elimination of liver metastases with a single cycle of IL-12 induction, and improved protection against tumour rechallenge. This was associated with a shift in the tumour microenvironment towards a more pro-immunogenic phenotype, with an increase in the CD8+/T regulatory cell ratio and a reduction in myeloid-derived suppressor cells. These effects were not seen with 5-fluorouracil, irinotecan or gemcitabine. Conclusions Long-term controlled expression of IL-12 using an HC-Ad vector in combination with oxaliplatin is effective and clinically applicable against hepatic colon cancer metastases. What is already know about this subject? 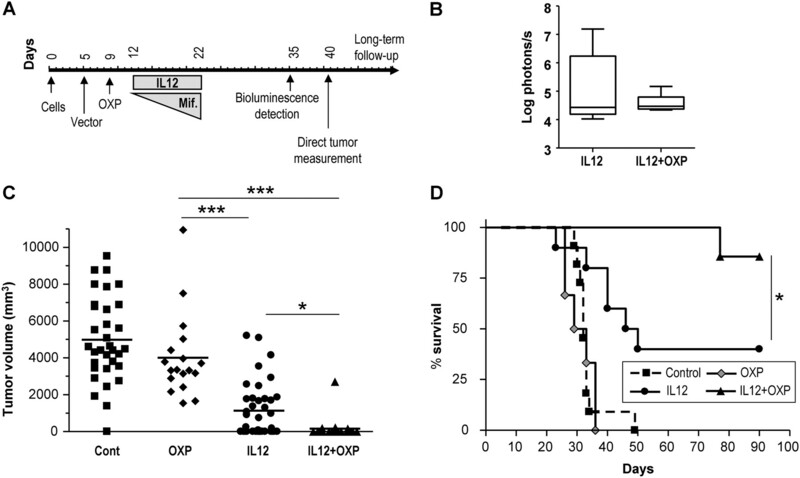 IL-12 is an immunostimulatory cytokine with antitumour effects in animal models of colorectal cancer. Methods to control the location, intensity and duration of IL-12 production are needed to increase the safety and efficacy of genetic immunotherapy. Tissue-specific, drug-inducible expression systems can be used to modulate the expression of transgenes in specific organs, but the biological effects of IL-12 can interfere with their functions. High-capacity (“gutless”) adenoviral vectors are efficient in long-term gene transfer of the liver. Using the HC-Ad/RUmIL-12 vector, individualised stepwise increases in the dose of inducer allowed the maintenance of therapeutic levels of IL-12 for >10 days, in cycles that can be repeated over a period of several months in mice. 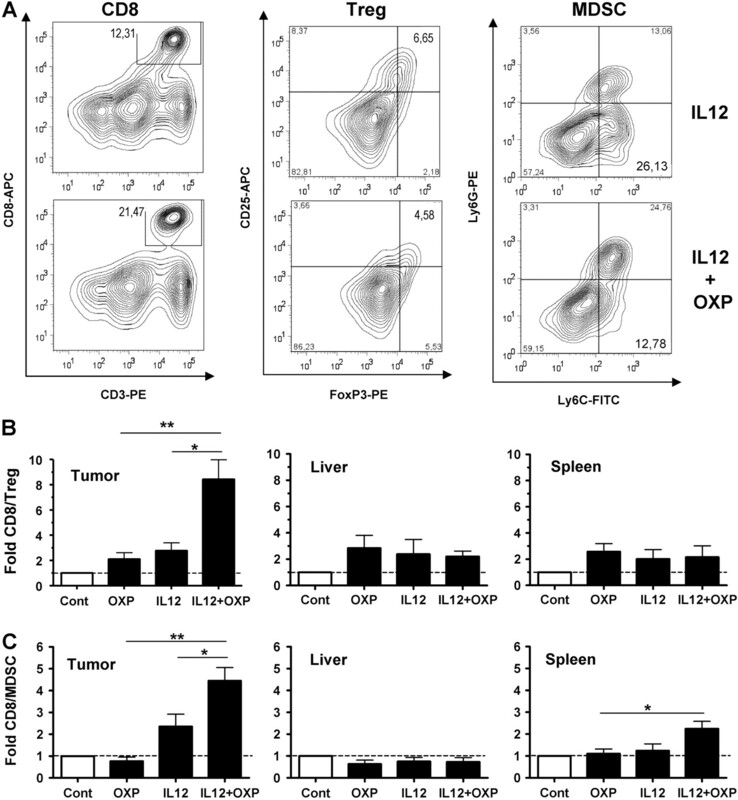 Oxaliplatin cooperates with IL-12 in the stimulation of an efficient immune response against cancer cells, with complete eradication of pre-established colorectal cancer liver metastases and prevention of experimental relapses in a syngeneic model. The mechanism of cooperation involves a reduction in the immunosuppressive microenvironment of tumours, with an increase in the ratio of CD8+/T regulatory cells and CD8+/myeloid-derived suppressor cells. Cooperation with IL-12 is not seen with other chemotherapeutic drugs such as 5-flurouracil, irinotecan and gemcitabine. The protocol described here is compatible with conventional oxaliplatin-based chemotherapeutic regimens, and it can be applied in conjunction with surgical or ablative treatments to avoid recurrence of colorectal cancer liver metastases. The MC38Luc1 cell line has been previously described.29 31 Cell lines were maintained in Dulbecco's modified Eagle's medium supplemented with 10% heat-inactivated fetal bovine serum, 100 μg/ml streptomycin and 100 μg/ml penicillin (all from Gibco, Invitrogen, Paisley, UK), 2 mM glutamine (Cambrex, Wiesbaden, Germany) and 400 μg/ml G418 (Geneticin, Gibco, Invitrogen). C57BL/6 and athymic (nu/nu) female mice (5–8 weeks old) were purchased from Harlan and Charles River, respectively (Barcelona, Spain). Hepatic tumours were established by direct implantation of 5×105 MC38Luc1 cells, as previously described.29 For subcutaneous tumour formation (rechallenge experiments), a total of 106 cells were injected in the right hind flank. Tumour size was monitored at indicated time points by measuring two perpendicular tumour diameters using a precision calliper. Tumour volume was calculated using the following formula: V= length×width2×0.5. Survival was checked daily and mice were euthanised if their general status deteriorated or subcutaneous tumours exceeded 20 mm in diameter. All in vivo experiments were performed in accordance with the local animal commission. Anaesthetised animals received the substrate D-luciferin (Promega, Madison, WI, USA) by intraperitoneal injection at 150 mg/kg. Ten minutes later, light acquisition was performed in an IVIS CCD camera system (Xenogen, Alameda, CA, USA) and analysed with the Living Image 2.20 software package (Xenogen). Typically, a circular region of interest measuring 3 cm in diameter was defined in the abdomen of mice, and quantification of light emission was performed in photons/second. The high-capacity (gutless) adenoviral vector HC-Ad/RUmIL-12 (also named GL-Ad/RUmIL-12) has been previously described.27 In this vector, all viral genes have been deleted and substituted by human non-coding DNA (“stuffer”), plus a transgene region containing a mifepristone (Mif)-inducible system for the expression of p35 and p40 subunits of murine IL-12. The transactivator of this system is expressed under the control of a liver-specific promoter (transthyretin). Both IL-12 subunits are co-expressed owing to an internal ribosomal entry site. Amplification of the vector was carried out as previously described.32 The virus was administered by direct intrahepatic injection surrounding the tumours after laparotomy.30 Typically, 2.5×108 infectious units (IU) of virus were mixed in a total volume of 50 μl saline solution before injection. Activation of the inducible system was carried out by intraperitoneal injection of Mif (RU486, Sigma, St Louis, MO, USA) dissolved in sesame oil (Sigma). Inductions started 2 weeks after implantation of cells. Administration of chemotherapy drugs was carried out by intraperitoneal injection. OXP (Eloxatin) was from Sanofi-Aventis (Essex, UK); 5-FU was from Ferrer Farma (Barcelona, Spain); irinotecan was from Hospira (Warwickshire, UK); gemcitabine (Gemzar) was from Lilly (Madrid, Spain). Animals treated with 5-FU received 50 mg/kg folinic acid (from Genericos Espanoles Laboratorio (GES, Madrid, Spain)) 1 h before 5-FU, and another dose together with 5-FU. Serum concentration of murine IL-12 and IFNγ were determined by OptE1A mouse IL-12 (p70) and mouse IFNγ ELISA kits (BD Biosciences PharMingen, San Diego, California, USA). High mobility group box 1 protein (HMGB1) in serum or supernatant of cells was quantified by ELISA kit from IBL International GmbH (Hamburg, Germany). Spleens, healthy livers and livers with tumours were harvested and treated with 400 U/ml collagenase D and 50 μg/ml DNase I (Roche Diagnostics, Indianapolis, IN, USA). After mechanical tissue dissociation, cells were passed through a 70 μm nylon mesh filter (BD Falcon, BD Bioscience, San Jose, California, USA) and washed. To enrich liver cell suspension in leucocytes, hepatocytes were removed with Percoll gradients. The single-cell suspension obtained was pretreated with anti-CD16/32 (clone 2.4G2; BD Biosciences Pharmingen) to reduce non-specific binding to Fc receptors. After this, cells were stained with the following fluorochrome-conjugated antibodies: CD8 (53-6.7), CD4 (clone RM4-5), CD25 (PC61), CD11b (M1/70), Ly6C (AL-21), F4/80 (BM8) and Ly6G (1A8) from BD Pharmingen. Intracellular staining for FoxP3 was performed using mouse regulatory T cell staining kit (BD Biosciences), according to the manufacturer's instructions. Cells were acquired on either a FACSCalibur or a FACSCanto flow cytometer (BD Biosciences). Flow cytometry data were analysed using FlowJo software (Tree Star, Ashland, OR, USA). CD8/Treg or CD8/MDSC ratios—that is, CD8 T-cell count divided by either Treg cell or MDSC count were calculated. A two-tailed unpaired t-test was used to compare two groups of values when n>10. For smaller groups, the Mann–Whitney non-parametric test was used. Comparisons of more than two groups were performed using analysis of variance with Bonferroni correction. Survival curves were compared by log rank test (GraphPad Prism software). Therapeutic use of IL-12 requires efficient methods to control the plasmatic levels of this potent immunostimulatory cytokine in order to avoid toxicity. We had previously determined in our MC38 syngeneic tumour model that seric IL-12 <20 ng/ml has no antitumour effect, and levels >700 ng/ml are associated with toxicity.27 The two main obstacles to keeping to this therapeutic range are the variability in transduction among individuals and the progressive silencing of the drug-inducible system mediated by the immune system.28 We have focused on the favourable dose–response effect of the Mif-inducible system (figure 1A) to design a new induction protocol. Once the liver has been transduced with the vector (typically 2.5×108 IU), a suboptimal amount of Mif (125 μg/kg) is administered for the first 2 days in order to prevent toxicity. The concentration of IL-12 is measured in serum 10 h after the first induction, and based on this information, a stepwise increase in Mif is scheduled according to table 1. Figure 1B shows the kinetics of IL-12 production obtained with the adjusted protocol. In contrast with a fixed amount of inducer (constant protocol), doubling the dose of Mif every 3 days contributes to the stabilisation of IL-12 levels for at least 10 days. Since downregulation of the system is due to a reversible inhibition of the transthyretin promoter,28 the induction protocols can be repeated after a resting period of at least 2 weeks in order to obtain several cycles of IL-12 expression (figure 2B). We have verified that the system is functional for more than 5 months, with a slow decrease in the intensity of expression in each cycle owing to the non-integrative nature of adenoviral vectors. Progressive increase in the dose of mifepristone (Mif) allows several cycles of sustained interleukin 12 (IL-12) expression in mice treated with the HC-Ad/RUmIL-12 vector. The vector was administered at 2.5×108 IU/mouse in C57BL/6 mice by intrahepatic injection. (A) Two weeks later, a single dose of Mif (125; 250; 1.000; 2.000 or 4.000 μg/kg) was administered intraperitoneally to different groups of animals (n=5). The concentration of IL-12 was measured in serum 10 h later. (B) Mice received daily injections of 250 μg/kg Mif for 10 consecutive days (constant protocol, white circles, n=10). A different set of animals received an adjusted protocol (black circles, n=8) consisting of 125 μg/kg Mif days 1–2; 250 μg/kg days 3–5; 500 μg/kg days 5–7 and 1000 μg/kg days 9–11. The concentration of IL-12 in serum was determined 10 h after induction at the indicated days. More than 2 months after the last Mif administration, a second cycle of inductions was repeated in the same group of animals using an adjusted protocol that started at 250 μg/kg Mif. The grey area represents the range of IL-12 concentrations considered therapeutic in the MC38 tumour model. Error bars represent SD. Oxaliplatin (OXP) increases the antitumour effect of interleukin 12 (IL-12) in a syngeneic model of colorectal cancer liver metastases. (A) Schematic representation of the experiment. MC38Luc1 cells (5×105 cells/mouse) were inoculated in the liver of C57BL/6 mice at day 0. Control animals (Cont) were left untreated (intrahepatic injection of saline solution), or treated with OXP alone (5 mg/kg intraperitoneal, group OXP). Other groups received the HC-Ad/RUmIL-12 vector by intrahepatic injection surrounding the tumours at day 5. Daily inductions with mifepristone (Mif) started at day 12 using an adjusted protocol (group IL-12). One subset of these animals received OXP (5 mg/kg intraperitoneal) 3 days before the first Mif administration (group IL-12+OXP). (B) Bioluminescence quantification performed at day 35. At this point, most animals in the control and OXP groups were dead. (C) Volume of hepatic tumours determined by direct measurement through laparotomy at day 40, or after necropsy at earlier time points in animals dead or killed for ethical reasons. (D) Survival of animals. Statistical significance: ***p<0.001; *p<0.05. Protection from tumour relapse or from the appearance of new liver metastases is crucial to improve the prognosis of patients with colorectal cancer. Therefore, we studied the immunological protection provided by our treatments against a tumour rechallenge. Animals that remained free from their hepatic tumours for more than 1 month after treatment with HC-Ad/RUmIL-12 (with or without OXP) received a new inoculation of MC38Luc1 cells in a distant location (subcutaneous). Tumour growth was monitored, showing that, on average, tumour progression was delayed in mice from both treatment groups in comparison with naïve animals (figure 3). Interestingly, the inhibition was more intense if the treatment regimen had included OXP, and the proportion of animals that was completely protected from the appearance of new tumours increased from 23% to 55%. Immunological protection against cancer cells in animals treated with interleukin 12 (IL-12) plus oxaliplatin (OXP). MC38Luc1 cells (106 cells/mouse) were inoculated subcutaneously in C57BL/6 mice whose hepatic tumours were cured after being treated with the HC-Ad/RUmIL-12 vector in the presence (group IL-12+OXP) or absence (group IL-12) of OXP. The same amount of cells was inoculated in naïve mice as a control. The average tumour volume for each group is represented. The number of mice remaining tumour-free for the entire observation period is indicated in parenthesis. Day 0 indicates the moment of inoculation of subcutaneous cells, which corresponds to at least 1 month after completion of the previous treatments. *p<0.05. 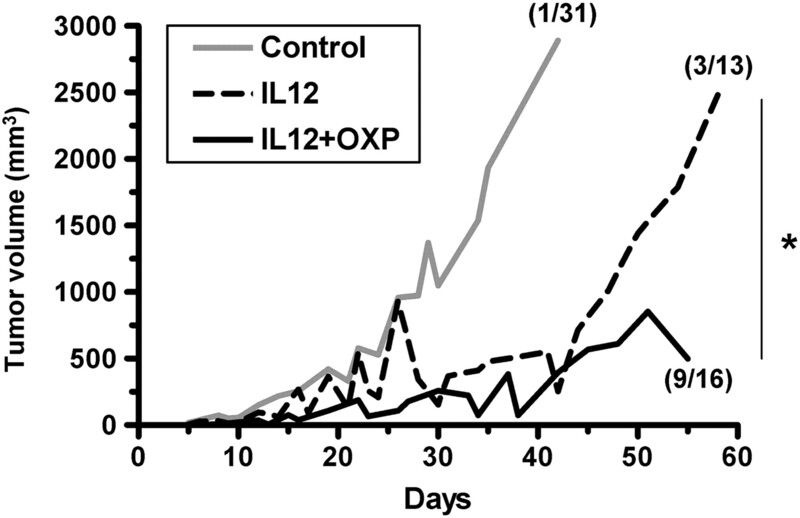 Oxaliplatin (OXP) enhances the immunostimulatory action of interleukin 12 (IL-12). Mice bearing intrahepatic MC38 tumours were treated with the HC-Ad/RUmIL-12 vector, and IL-12 expression was induced with mifepristone (Mif) following an adjusted protocol (IL-12 group). A subset of animals received 5 mg/kg OXP intraperitoneally 3 days before the first induction (IL-12+OXP group). Other groups were left untreated (cont), or treated with OXP only. Blood was collected 24 h after the administration of OXP (considered as day 1), and 10 h after the first, third and sixth Mif inductions (days 3, 5 and 8, respectively). The concentration of high-mobility group box 1 protein (HMGB1) (A) and interferon γ (IFNγ) (B) was determined by ELISA (n=10). *p<0.05. Next, we verified that OXP does not cause a significant increase in the production of IL-12 mediated by HC-Ad/RUmIL-12 (data not shown). 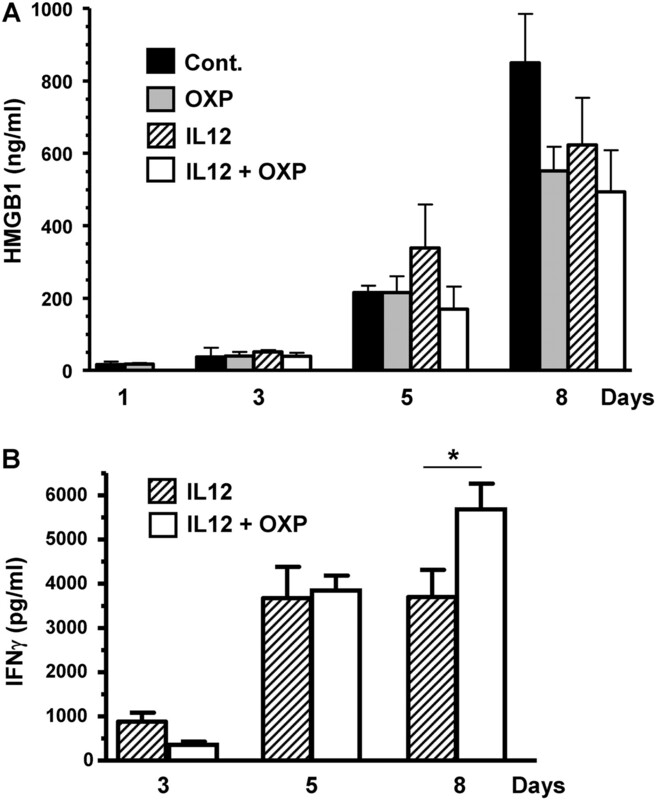 However, the amount of IFNγ produced in response to IL-12 was higher in the group treated with OXP (figure 4B), suggesting a stronger activation of the immune system. This effect was seen 6 days after the initiation of IL-12 expression, and coincides with the peak of IFNγ stimulation. Using major histocompatibility complex tetramer staining specific for an MC38 epitope we detected a moderate increase in the frequency of CD8+ T lymphocytes in peripheral blood in response to IL-12, but the addition of OXP did not significantly increase this population (data not shown). Therefore, we studied the tumour microenvironment to evaluate whether the combined treatment had an effect on the local immunosuppressive cell populations. A favourable balance between T-effector and T-suppressor cells has been associated with improved immune responses against tumours.36 37 Tumour, liver and spleen from control and treated animals were collected 3 days after the initiation of IL-12 expression, and leucocyte populations were analysed by flow cytometry. We observed no change in the NK cells in any of these tissues (data not shown). However, the ratio between CD8+ T lymphocytes and Tregs (CD25+FoxP3+ population) was significantly increased in the tumours of mice treated with IL-12 in combination with OXP, in comparison with IL-12 alone. Interestingly, this effect was not seen either in the surrounding liver, or in the spleen of these animals (figure 5A,B). Similar results were obtained in samples obtained on the sixth day of IL-12 induction (not shown). In addition, we found that the combined treatment caused a decrease in the monocytic myeloid-derived suppressor cells (MDSC), defined as the CD11b+Ly6C+Ly6G- population.38 The ratio CD8+/MDSC was slightly elevated in the tumours of mice treated with IL-12, but it was significantly enhanced if OXP was included in the therapeutic regimen (figure 5A,C). In this case, the ratio was also increased in the spleen, but not in the liver. Since monocytic MDSC have the potential to differentiate into tumour-associated macrophages,7 38 we determined the treatment-induced changes in the expression of the macrophage differentiation marker F4/80. We found that the vast majority of myeloid-derived cells in our tumour model remained in an undifferentiated state, and no changes were seen with any of the treatment conditions (supplementary figure 3). Oxaliplatin (OXP) counteracts the immunosuppressive microenvironment of tumours. C57BL/6 mice bearing intrahepatic MC38 tumours were treated with the HC-Ad/RUmIL-12 vector in the absence or presence of OXP, as indicated (n=10). Interleukin 12 (IL-12) expression was obtained using an adjusted induction protocol with mifepristone (Mif), and animals were killed after the third day of induction. Control groups include untreated animals (Cont) and mice treated with OXP alone (n=10). Leucocytes were isolated from liver, spleen and tumour samples. CD8+ T cells, regulatory T cells (Treg; CD25+FoxP3+) and monocytic myeloid-derived suppressor cells (MDSC; CD11b+Ly6C+Ly6G-) were identified by flow cytometry. (A) Countour plots showing the percentage of CD8 T cells (CD3+CD8+), Tregs (CD4+CD25+FoxP3+) and MDSC (CD11b+ly6C+Ly6G-) in representative mice treated with the HC-Ad/RUmIL-12 vector in the absence or presence of OXP (IL-12 and IL-12+OXP groups, respectively). Countour plots are gated on alive cells (CD8 T cells), CD4 cells (Tregs) or CD11b+ cells (MDSC). (B and C) The fold increase in the ratio of CD8/Treg (B) and CD8/MDSC (C) are represented, considering the untreated group as a reference. Together, these data indicate that OXP collaborates with IL-12 to reduce the immunosuppressive microenvironment of tumours. This effect is not shared by other agents frequently used against colorectal cancer. For instance, treatment with irinotecan alone or in combination with HC-Ad/RUmIL-12 did not increase the CD8/Treg and CD8/MDSC ratios (figure 6A and B). Interestingly, we found that 5-FU and gemcitabine caused an increase in the CD8/MDSC ratio, in accordance with other reports.39 40 However, this effect was reversed when the drugs were combined with IL-12. Although irinotecan and gemcitabine cooperated with IL-12 in the eradication of hepatic lesions and increased the survival of animals (figure 6C), they did not improve the immunological protection against tumour rechallenge (figure 6D), suggesting that alternative mechanisms are taking place. Combination of interleukin 12 (IL-12) and other chemotherapeutic drugs. Mice bearing intrahepatic MC38 tumours were treated with the HC-Ad/RUmIL-12 vector, and IL-12 expression was induced with mifepristone (Mif) following an adjusted protocol (IL-12 group). Subsets of animals received additional treatment with one of the following chemotherapeutic drugs: 25 mg/kg 5-fluorouracil (5-FU) plus 100 mg/kg leucovorin on 2 consecutive days, starting 3 days before the first Mif induction (IL-12+5-FU); a single dose of 150 mg/kg irinotecan (Iri), 3 days before induction (IL-12+Iri); two doses of 60 mg/kg gemcitabine (Gem), 3 days and at the time of induction (IL-12+Gem). Other groups were left untreated (cont), or treated with the chemotherapeutic drugs only. Five animals from each group were killed after the third day of induction and tumours were processed for analysis of CD8+ T cells, regulatory T cells (Treg; CD25+FoxP3+) and monocytic myeloid-derived suppressor cells (MDSC; CD11b+Ly6C+Ly6G-) by flow cytometry. The fold increase in the ratio of CD8/Treg (A) and CD8/MDSC (B) are represented, considering the untreated group as a reference. The remaining animals completed the full induction protocol and survival was monitored (C). 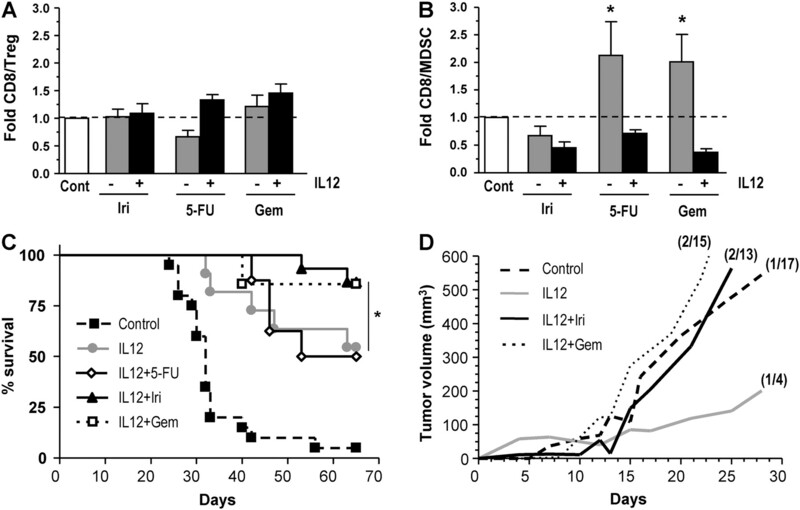 Death of animals was due to tumour progression, except for three mice in the group IL-12+Gem that died before the completion of the treatment owing to toxicity and were excluded from the survival curve. Animals treated with the chemotherapy drugs without IL-12 had no survival benefit compared with the untreated group, and are not represented in the graphic. Cured animals from the IL-12, IL-12+Iri and IL-12+Gem groups received a subcutaneous rechallenge with MC38Luc1 cells (106 cells/mouse). The same amount of cells was inoculated in naïve mice as a control. The average tumour volume for each group is represented (D). The number of mice that remained tumour-free for the entire observation period is indicated in parenthesis. *p<0.05. Potential clinical application of immunochemotherapy will surely require repeated cycles of treatment to control the initial lesions and to prevent, or eventually cope with, relapses and the appearance of new metastases. In order to mimic this situation, we initiated a series of experiments in which mice bearing hepatic tumours were treated with two cycles of IL-12 induction after vector administration. Then, they were subjected to a subcutaneous tumour rechallenge and, finally, a third cycle of induction was completed. In total, mice were evaluated for 5 months from the establishment of the initial hepatic tumours (see schematic representation in figure 7A). Three days before each of these cycles, one group of animals received a single dose of OXP (5 mg/kg). Interestingly, we observed that two cycles of IL-12 induction separated by 2 weeks efficiently controlled the hepatic tumours and extended the survival time of mice (figure 7B, left part of the graphic). In this setting, the cooperation of OXP was not apparent because most animals were cured. Long-term management of colorectal cancer. Cooperation of oxaliplatin (OXP) and interleukin 12 (IL-12) for the control of experimental relapses in distant locations. (A) Schematic representation of experiments. C57BL/6 mice bearing hepatic tumours were treated with the HC-Ad/RUmIL-12 vector and received two cycles of mifepristone (Mif) induction preceded or not by OXP (5 mg/kg, intraperitoneally). Animals cured from their hepatic tumours were subjected to a subcutaneous challenge with the same tumour cells (MC38Luc1), and received a third cycle of induction during the indicated days. (B) Overall survival of mice. The grey areas indicate the duration of each induction cycle. Most animals in the OXP and OXP+IL-12 groups were cured from their hepatic tumours (not shown). The day of subcutaneous tumour rechallenge is marked with a vertical dotted line. ‘Control rechallenge’ refers to naïve animals that were inoculated with tumour cells and received no treatment. Mice were killed when the tumour burden reached the ethical end point. Survival after rechallenge was significantly higher in all treated groups than in control (p<0.01). Survival of animals in the IL-12+OXP group was significantly higher than in the IL-12 group (p<0.04). The progression of individual subcutaneous tumours in the rechallenge experiment is represented in panels C (group IL-12) and D (group IL-12+OXP). The duration of the induction protocol (Mif) and the day of administration of OXP are indicated. All naïve animals inoculated with tumour cells developed tumours that progressed in the absence of treatment (not shown). One month after the completion of the second cycle of induction, the subcutaneous tumour challenge was performed in mice that had rejected the hepatic lesions. Compared with the results obtained with a single cycle of induction, no increase in the immunological protection was seen with any of the treatments. Therefore, we had the opportunity to evaluate whether a third cycle of induction might control the progression of the subcutaneous tumours, as if they were distant metastases. As shown in figure 7C, IL-12 alone was unable to inhibit the growth of the tumours that had escaped the initial immunological protection. In contrast, the combination of IL-12 and OXP obtained a response in 60% of the tumours (figure 7C). Of note, these tumours had progressed for more than 3 weeks and some of them exceeded 1000 mm3 in volume before the third induction cycle started. As a result, the overall survival of animals, including deaths from the tumour rechallenge, was improved by the incorporation of OXP in the treatment (figure 7B, right part of the graphic). The development of a long-term expression vector based on adenovirus enables an efficient delivery of therapeutic genes into the liver.25 In this approach, the target cells for transduction are the “normal” hepatocytes, not the cancer cells. This reduces the variability of infectivity and makes the gene transfer more predictable. The possibility of regulating the intensity of IL-12 expression by adjusting the dose of an inducer is important for the clinical application of immunogene therapy. It allows the use of relatively high doses of vector, to ensure that the liver of all patients is efficiently transduced. Then, careful monitoring of the individual response to the inducer will guide the intensification of the regimen, a concept that is common to many oncological treatments. There is abundant information about the safety of Mif at doses higher than those used here,41 42 suggesting that the potency of the system could be increased further. Predicting the duration of treatment that would be needed in patients based on our preclinical results is too speculative. However, we provide evidence indicating that sustained expression of IL-12 is beneficial. One cycle of Mif induction is suboptimal in our tumour model. Repetition of short cycles does not improve the efficacy (data not shown), thus both the number of cycles and their duration are important—that is, the total period covered by therapeutic levels of IL-12. This requirement will probably depend on the severity of the disease. Although suppressive mechanisms used by tumours to evade the immune attack may be activated by IL-12,43 44 the net balance on tumour control is still positive. Our data suggest that OXP may enhance the immune response against tumours by tipping the balance between effector and regulatory/suppressor cells in favour of effector cells, as has been previously described for other chemotherapeutic drugs.37 Stimulation of Treg development by MDSCs has been described in some tumour models,45 indicating that mutual influence of these suppressive populations is possible. Recently, it has been shown that the inhibition of MDSC accumulation by sunitinib increases the antitumour effect of IL-12,46 supporting the relevance of this mechanism. The need for a complementary mechanism that initiates the damage to cancer cells may be particularly important in the protocol proposed here, since expression of IL-12 takes place in the liver parenchyma surrounding the tumour. Although we did not detect a consistent increase in the exposure of CRT in MC38 cells exposed to OXP, we cannot rule out the possibility that small amounts may contribute to immunogenicity of the cells, as recently described for other murine colon cancer cells.14 Our results point to a previously unrecognised mechanism taking place when OXP is used in combination with IL-12, but further studies are needed to gain a more detailed understanding of the immunostimulatory properties of OXP. The vector and the experimental conditions described here can be easily adapted to evaluate other immunochemotherapy combinations of new combined protocols. Careful testing of specific combinations is required, because the effect of drugs on the immune system may be different when used as monotherapy or together with IL-12 stimulation, as suggested by the results obtained with 5-FU and gemcitabine. This phenomenon is currently under investigation. In summary, the finding that controlled expression of IL-12 in the liver complements OXP-based chemotherapy regimens opens new possibilities for the management of patients with advanced colorectal cancer.
. Current treatment for liver metastases from colorectal cancer. World J Gastroenterol 2003;9:193–200.
. Management of hepatic metastasis from colorectal cancers: an update. J Hepatobiliary Pancreat Surg 2008;15:570–80.
. Five-year data and prognostic factor analysis of oxaliplatin and irinotecan combinations for advanced colorectal cancer: N9741. J Clin Oncol 2008;26:5721–7.
. Tumour response and secondary resectability of colorectal liver metastases following neoadjuvant chemotherapy with cetuximab: the CELIM randomised phase 2 trial. Lancet Oncol 2010;11:38–47.
. Colorectal cancer: new advances in immunotherapy. Cancer Biol Ther 2007;6:11–17.
. T-regulatory cell modulation: the future of cancer immunotherapy? Br J Cancer 2009;100:1697–703.
. Combinatorial treatments including vaccines, chemotherapy and monoclonal antibodies for cancer therapy. Cancer Immunol Immunother 2009;58:317–24.
. Chemo-immunotherapy of colorectal carcinoma: preclinical rationale and clinical experience. Invest New Drugs 2006;24:99–110.
. Immunity feedback and clinical outcome in colon cancer patients undergoing chemoimmunotherapy with gemcitabine + FOLFOX followed by subcutaneous granulocyte macrophage colony-stimulating factor and aldesleukin (GOLFIG-1 Trial). Clin Cancer Res 2008;14:4192–9.
. Molecular interactions between dying tumor cells and the innate immune system determine the efficacy of conventional anticancer therapies. Cancer Res 2008;68:4026–30.
. Immunogenic death of colon cancer cells treated with oxaliplatin. Oncogene 2009.
. Interleukin-12: biological properties and clinical application. Clin Cancer Res 2007;13:4677–85.
. A phase II trial of interleukin-12 in patients with advanced cervical cancer: clinical and immunologic correlates. Eastern Cooperative Oncology Group study E1E96. Gynecol Oncol 2004;92:957–64.
. Phase I evaluation of intravenous recombinant human interleukin 12 in patients with advanced malignancies. Clin Cancer Res 1997;3:409–17.
. Gene therapy of orthotopic hepatocellular carcinoma in rats using adenovirus coding for interleukin 12. Hepatology 2001;33:52–61.
. Immunotherapy and immunoescape in colorectal cancer. World J Gastroenterol 2007;13:5822–31.
. Adenovirus-mediated interleukin-12 gene therapy for metastatic colon carcinoma. Proc Natl Acad Sci U S A 1996;93:11302–6.
. Phase I trial of intratumoral injection of an adenovirus encoding interleukin-12 for advanced digestive tumors. J Clin Oncol 2004;22:1389–97.
. Positron emission tomography imaging of adenoviral-mediated transgene expression in liver cancer patients. Gastroenterology 2005;128:1787–95.
. Administration of helper-dependent adenoviral vectors and sequential delivery of different vector serotype for long-term liver-directed gene transfer in baboons. Proc Natl Acad Sci U S A 1999;96:12816–21.
. Helper-dependent adenovirus vectors elicit intact innate but attenuated adaptive host immune responses in vivo. J Virol 2004;78:5966–72.
. Efficient, long-term hepatic gene transfer using clinically relevant HDAd doses by balloon occlusion catheter delivery in nonhuman primates. Mol Ther 2009;17:327–33.
. Genomic DNA transfer with a high-capacity adenovirus vector results in improved in vivo gene expression and decreased toxicity. Nat Genet 1998;18:180–3.
. Prolonged and inducible transgene expression in the liver using gutless adenovirus: a potential therapy for liver cancer. Gastroenterology 2004;126:278–89.
. Interleukin-12 inhibits liver-specific drug-inducible systems in vivo. Gene Ther 2008;15:277–88.
. Evaluation of bioluminescent imaging for noninvasive monitoring of colorectal cancer progression in the liver and its response to immunogene therapy. Mol Cancer 2009;8:2.
. Intrahepatic injection of adenovirus reduces inflammation and increases gene transfer and therapeutic effect in mice. 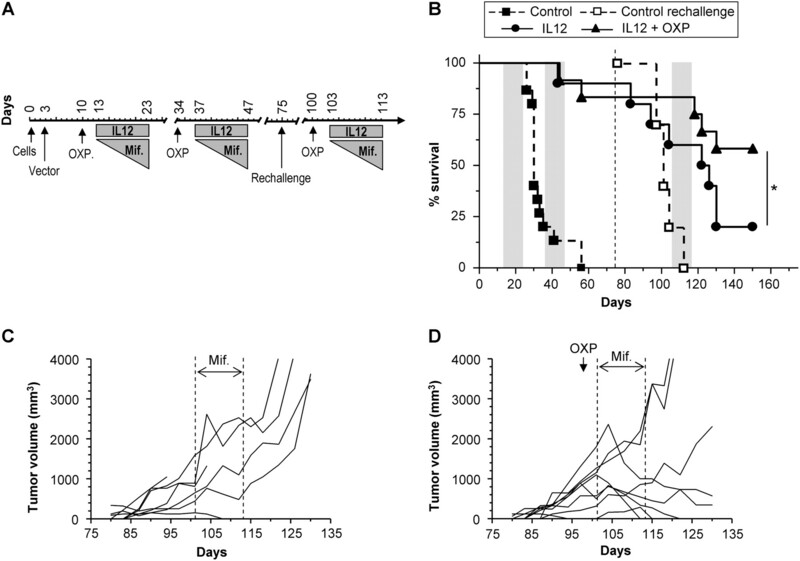 Hepatology 2006;44:623–32.
. A helper-dependent adenovirus vector system: removal of helper virus by Cre-mediated excision of the viral packaging signal. Proc Natl Acad Sci U S A 1996;93:13565–70.
. TRAIL gene-armed oncolytic poxvirus and oxaliplatin can work synergistically against colorectal cancer. Gene Ther 2010;17:550–9.
. Overexpression of high-mobility group box 1 correlates with tumor progression and poor prognosis in human colorectal carcinoma. J Cancer Res Clin Oncol 2010 May;136:677–84.
. HMGB1 mediates endogenous TLR2 activation and brain tumor regression. PLoS Med 2009;6:e10.
. Intraepithelial CD8+ tumor-infiltrating lymphocytes and a high CD8+/regulatory T cell ratio are associated with favorable prognosis in ovarian cancer. Proc Natl Acad Sci U S A 2005;102:18538–43.
. 5-Fluorouracil selectively kills tumor-associated myeloid-derived suppressor cells resulting in enhanced T cell-dependent antitumor immunity. Cancer Res 2010;70:3052–61.
. Emergency postcoital contraception. N Engl J Med 1997;337:1058–64.
. A phase II study of mifepristone (RU-486) in castration-resistant prostate cancer, with a correlative assessment of androgen-related hormones. BJU Int 2008;101:1084–9.
. Induction of immunosuppressive molecules and regulatory T cells counteracts the antitumor effect of interleukin-12-based gene therapy in a transgenic mouse model of liver cancer. J Hepatol 2007;47:807–15.
. Repeated administrations of interleukin (IL)-12 are associated with persistently elevated plasma levels of IL-10 and declining IFN-gamma, tumor necrosis factor-alpha, IL-6, and IL-8 responses. Clin Cancer Res 2003;9:76–83.
. Reversion of immune tolerance in advanced malignancy: modulation of myeloid-derived suppressor cell development by blockade of stem-cell factor function. Blood 2008;111:219–28.
. The novel role of tyrosine kinase inhibitor in the reversal of immune suppression and modulation of tumor microenvironment for immune-based cancer therapies. Cancer Res 2009;69:2514–22. Funding This work was funded in part by Fundacion Ramon Areces; Fundacion MMA; grant SAF2009-11324 from the Spanish Department of Science; Fundacion Pedro Barrie de la Maza; Condesa de Fenosa; INMUNONET-SOE1/P1/E014; Instituto de Salud Carlos III and the UTE project CIMA. JM-E was supported by a fellowship from Spanish FIS. PB was supported by a Juan de la Cierva contract from Spanish MEC and a Miguel Servet contract from Spanish Instituto de Salud Carlos III. RHA was supported by a Ramon y Cajal contract from Spanish MEC. JC was in receipt of a grant from Gobierno de Navarra.